South African native Dr. Cobus du Toit is praised for "technical facility that makes everything look easy" (Opus Colorado) and "rich tone that is especially impressive" (Herald Tribune). A strong advocate for the musical arts, Cobus is an avid soloist, chamber musician and pedagogue who has recently joined the faculty at the University of Massachusetts Amherst. Cobus can be heard live in concert across the world with summer performances in Colorado, California and Indonesia. As an international soloist and chamber musician, Cobus has performed with orchestras in Russia, South Africa and the United States and on concert series in Taiwan, Japan, Germany and France. 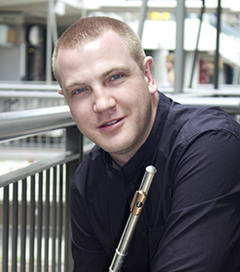 Cobus has been a prize winner at over a dozen competitions which include the 1st UNISA Southern African National Competition for Woodwinds and Brass, the Byron Hester Competition, the Myrna Brown Competition and the SAMRO International Scholarship Competition. In addition to being the principal flute for the Boulder Chamber Orchestra, Cobus is also the flutist for the Antero Winds, a professional woodwind quintet that has been prizewinners at both the Plowman and Fischoff chamber music competitions. Cobus self-produced two recordings available through online platforms: Tríptico with classical guitarist Patrick Sutton and Mythavian with pianist Doreen Lee. Cobus received his Master of Music and Doctor of Musical Arts from the University of Colorado at Boulder and a Bachelor of Music from the University of Pretoria. His principal teachers include John Hinch and Christina Jennings.